At this point, Bill’s life takes a downward plunge into a world of alcoholism, unemployment, and homelessness. But an unlikely series of events suddenly sheds a beacon of light on the hopelessness of his life, and he is given a second chance at love and happiness—but only if he rises to the challenge. "The other book, For What He Could Become—also a first—was penned by a recent acquaintance of mine, Jim Misko. I purchased the book as a gesture of solidarity, but I had low expectations of it. Jim, after all, is a realtor, and everyone knows realtors can't write—they just fill in the blanks.​ Three days later, I finally put the book down. I had taken it with me everywhere: to bed, into the loo, to the bank so I could read while standing in line, to my last CLE where I concealed it behind the handout as I read (a trick I learned in ninth grade algebra). 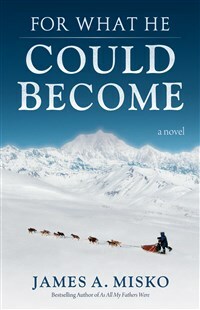 As his protagonist Bill wanders away from Alaska, the characters seem to become more two-dimensional, less individualistic, as if that part of Bill's life is dreamlike, unreal, until he returns to the local color. I like to think that this is a style that portends something uniquely Alaskan (although Jim's second book, which I have not read, is set outside Alaska). I have my own idea of what happened to the protagonist, Bill, after the book ends; Jim, when I explained it to him, disagreed with me, but, after spending three-hundred and some pages with the man, I know Bill—better than I know Jim. And I like Bill the better for his flaws and his destiny, that the beauty of the human soul lies not in its backdrop, but in its moments of transcendence."